Harvey Milk understood the power of human empathy when he famously advised his “gay brothers and sisters” to come out, but “only to the people you know, and who know you.” It is hard to hate people you know and who know you. Obviously, there are some key differences between EmoSPARK and Samantha. 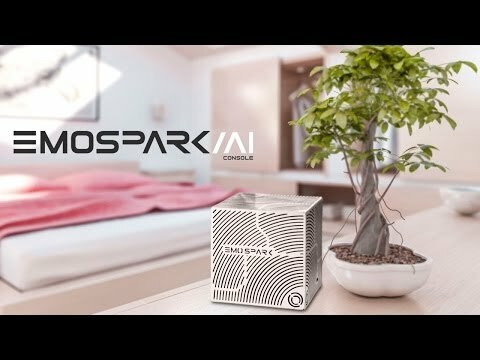 EmoSPARK doesn’t appear to read your emails. Its voice is closer to the emotion-lessMajel Barrett-Roddenberry on Star Trek than the flirty Scarlett Johansson. Its ability to have real interactions with users is suspect and might be limited to suggesting YouTube clips and Facebook posts. But they’re both designed to get to know you and adapt their actions to what they learn. And both EmoSPARK and Samantha interact with people using a conversational interface. If humans start to think of their EmoSPARKs as actual people, that interface might be the reason. When we have conversations with a machine, we start to think of that machine as a person. The late Stanford professor Clifford Nass said, “Our brains are built to treat these conversations with computer-based voices to an incredible degree like [conversations] we are having with actual people—including flattery, flirtation and all the rest.” If EmoSPARK determines that nothing perks you up after a bad day likeCommunity bloopers and starts to verbally tell you about clips available on the Internet, your brain will rewire itself to think of the AI appliance as a fun, quirky roommate.